Henry Heguy was one of Seaboard's first employees. He was the navigator on Seaboard's first flight in May, 1947. He was also the navigator on Seaboard's first passenger flight in Sept. 1947. He subsequently married one of the flight attendants on that flight, Laura Jane Boggess. He later went into management and served eight years in Luxembourg as Seaboard's European manager. Before they left Luxembourg in 1956, he and Laura Jane were honored at a dinner, as seen here. They returned to New York and Henry was appointed vice president, system operations. On Oct. 17, 1980, shortly after the merger with Flying Tigers, Henry was honored when Laura Jane dedicated a new Boeing 747F, the "Henry L. Heguy". 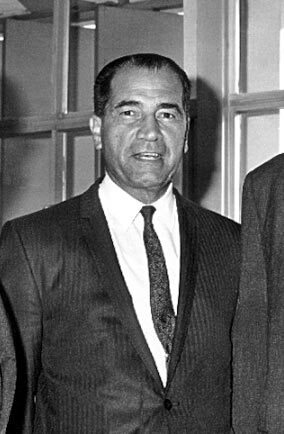 Henry is seen here in 1969.